I have been lucky to have some great mentors in my life… my father, the late Boyd Jones; a college professor who believed in me, Sharon Bass; our editor-at-large, Ed Hiscock, who took me under his wing during my time at GCSAA; and even my local bar owner, Rick Younger, who has treated me like a son for 20 years. A Sports Illustrated story came out a year ago that inspired me. The story was “The Ultimate College Football Road Trip.” The premise was this: If you had unlimited funds, a nice RV and a entire fall season off work… where would you go for a once-in-a-lifetime road trip to see as many great games as possible? Where would you start, where would you finish? I wrote down the names of four superintendents I’ve come to know over the years whom I admire, and I reached out to their apprentices to glean some of what makes those superintendents special. The stories I heard were both fun and inspirational. Arron McCurdy, whom I met when I worked the 2013 U.S. Open at Merion, spoke candidly with me about the importance of his mentor, Matt Shaffer. I understood what McCurdy was talking about, and it made me even more excited for the story. So I got on the road to learn about some of the people who I consider to be the best in the business. I first met Mike McCormick at Oakmont during the 2016 U.S. Open. He was an assistant superintendent then working for John Zimmers (now at Inverness Club in Toledo) and current Oakmont superintendent David Delsandro. Mike now is superintendent at the Apawamis Club in Rye, N.Y.
McCormick is proud to consider himself the last of the true Bator disciples… he worked for the legendary superintendent (stints at Pine Valley, Merion, Oak Hill) at his final course, The International Club in Bolton, Mass., before Bator retired and became a consultant. McCormick is happy to share stories of his time with Bator, who he says has had a monumental impact on his life and career. McCormick says high-pressure situations don’t bother him much after being in so many of those situations with Bator. If McCormick took one thing away from his experience with Bator, he says it’s his dedication to the industry. That’s just Volume 1. McCormick has multiple volumes on his bookshelf, which include magazine articles with Bator’s hand-scribbled notes alongside the stories. McCormick could tell Bator stories all day, but I had to get moving to my next superintendent. I knew Matt Shaffer prior to the 2013 U.S. Open at Merion, but it was leading into the tournament that I got to know him and his crew better. To get some information on Shaffer, who is now enjoying semi-retirement, I contacted two guys who were working on the crew during the ’13 U.S. Open — Arron McCurdy, now superintendent at Metedeconk National GC, Jackson, N.J., and Pat Maher, now superintendent at Parkersburg CC, Vienna, W.Va.
“It was challenging working for him,” McCurdy told me, “and at the same time it was rewarding and fun. My time at Merion was more rewarding than any other time in my career. He would tell us, it’s not about you… (Merion) has history and you chose to work here. If you want to work at this level, this is what it entails. Maher echoes those comments, and says getting people to work together is Shaffer’s greatest talent. Maher also says that despite the long hours, Shaffer ultimately put family first. If McCurdy could absorb one attribute from Shaffer, it would be his ability to defuse situations with a sense of humor and brutal honesty. Leaving behind the Merion guys, my journey took me to Minnesota to learn about Bill Larson, CGCS at Town & Country Club of St. Paul. I profiled Larson in the February 2015 issue — he was the winner of that year’s Herb Graffis Businessperson of the Year Award. I talked to Aaron Johnson, CGCS at Dacotah Ridge GC in Morton, Minn., and Ryan Browning, superintendent at Valleywood GC in St. Paul, Minn. Both men were given good advice early in their careers: Go work for Larson if you want to succeed in the Minnesota golf market. Browning firmly believes he wouldn’t be where he is today if he had not worked for Larson. Both Johnson and Browning were given multiple opportunities to lead while they worked for Larson. Browning recalls Larson asking him a blunt question that marked a turning point in his career. Johnson still leans on Larson today as a sounding board on topics from agronomic practices to personnel decisions. He says if he could reflect one attribute of Larson’s, it would be his salesmanship. Full disclosure: David Hay, longtime superintendent and currently CGCS at the 54-hole Mission Hills CC in Rancho Mirage, Calif., is a mentor of mine. He calls me “son” and celebrates my career achievements with me. No way was I leaving him out of this story. So that’s why I bothered John Leistiko in the middle of aerification. Leistiko has been at Bear’s Best in Las Vegas since 2001, and he’s been the superintendent there since 2007. John started working on golf courses right out of high school. 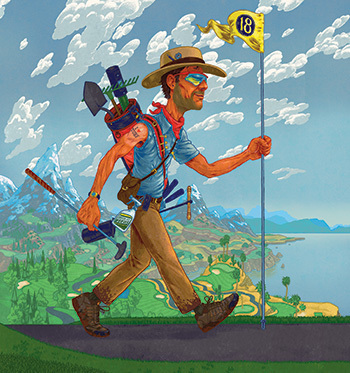 He moved up in the Las Vegas golf market the old fashioned way — hard work. Hay was a regional superintendent overseeing several courses in Las Vegas for ClubCorp when he first started advising Leistiko. The two remain close today. I asked Leistiko if he’s been able to adopt David’s low-key attitude. He says he’s working on it, but admits he’s not been successful. Leistiko says if he could mimic one skill of Hay’s, it would be the way he handles people and gets the best out of them. He stays positive, even in bad situations. I could have talked to Leistiko all day, but the aerifer was calling him and I knew it was time to wrap up the road trip and file my story. I only made it as far west as Las Vegas. A valiant effort, but the project made me want more. So I ask you: Who is your mentor? Who should I visit in 2019, and when are we going?